It was another exhilarating Goodwood event as BTCC, Le Man, F1, Rally and TV stars descended to the Goodwood Revival last weekend. 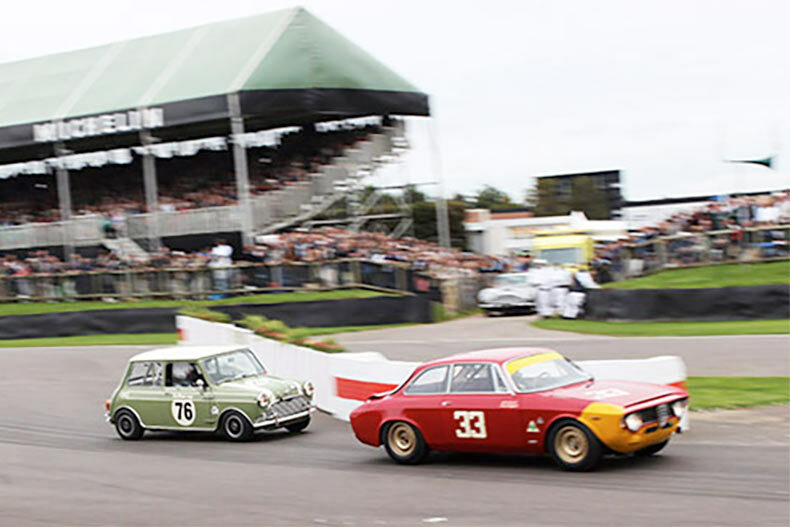 The three day event featured a wide array of races including the Brooklands Trophy for pre-war Sports cars, the RAC TT Celebration race for 1960s GT cars and the Barry Sheene Memorial Trophy for 500cc GP bikes of the 1960 as well as the star studded St Mary’s Trophy for 1960’s Touring Cars. Split into two races, part 1 was for celebrities and professional drivers including the likes of Le Man winner Tom Kristensen and BTCC champions Andrew Jordan and Matt Neal. Swiftune featured with the four Mini’s of James Martin, Jason Stanley, Chris Lilingston-Price and the Swiftune Works Mini with Nick Swift. Official practice on the Friday set the weekends grid positions and was again split into two sessions. Joining TV chef James Martin was BTCC champion Jason Plato who set the fastest Mini time with F1, Le Man and Formula E driver Karun Chandhok just half a second behind in the Swiftune works car. Race 1 had the top two Mini’s fighting for 12 overall. Making a great start, Chandhok got the advantage off the line and lead the race finishing 1st Mini, Plato followed to finish 2nd. F1 Red Bull boss Christian Horner who was partnered with Chris Lillingston-Price wasn’t far behind, finishing in 3rd and 15th overall and Rauno in 4th. Meanwhile, Tom Kristensen put on a admirable display in the Alan Mann Fairlane Thunderbolt, starting 29th on the grid and finishing 1st overall, passing half the grid in the first few laps. It was the owners turn on the Sunday, Nick Swift qualified an amazing 7th overall in the Swiftune works Mini, meaning it was set to be a thrilling race as he battled against the top running Cortina’s, BMW and the mighty Fairline Thunderbolt. Making a great start, within the first couple of corners, Nick had already made his way to 3rd place and was chasing Henry Mann in the Thunderbolt. However the larger more powerful car had the speed and the little Mini was not able to keep up. Nick managed to keep up with the Alfa Romeo 1600 GTA of Alex Furiani and were having a great battle for 5th. As the Alfa had the grunt on the straights, the Mini completely made up for it on the corners, as it slid round sideways with little need for the brake! The two cars had a crowd pleasing race long battle, but after many skilled overtaking manoeuvres, Nick was unable to pass the rapid Alfa and finished in 6th and first Mini. Jason Stanley finished 2nd Mini, while James Martin and Chris Lillingson-Price had a great battle for 3rd in class and James crossed the line just in front to finish 14th overall. Another top 4 finishers for Swiftune! The two Swiftune 1275 GT’s come out to play! Happy New Year- An exciting year ahead for Swiftune!